A portrait of a doe-eyed young girl peers out from the linen wrappings of a 1,900-year-old mummy. Her visage was among the extraordinarily rare mummy portraits in “Paint the Eyes Softer: Mummy Portraits from Roman Egypt,” an exhibit at the Block Museum of Art this winter. 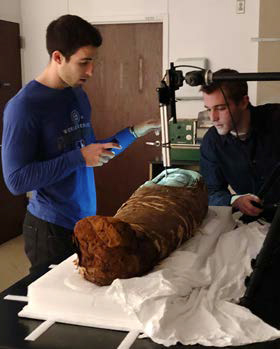 The mummy and exhibit were the focus of an advanced undergraduate seminar during which students performed hands-on work to learn how ancient materials were made, used and buried.